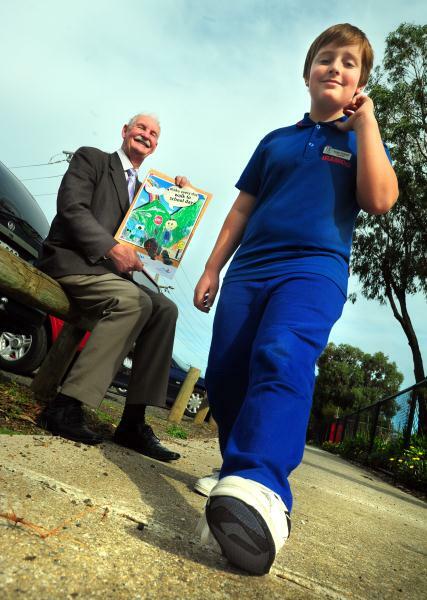 WYNDHAM Council has launched a new campaign to encourage parents to walk their children to school, with a little help from one student in particular. Lachlan, from Iramoo Primary School, won a recent competition to design a poster to promote the Make Every Day Walk to School Day campaign as part of the VicHealth’s 2013 ‘Walk to School’ initiative. His winning image features a drawing of his daily journey to school. The campaign encourages parents to walk their children to school, when possible, to get some exercise and relieve congestion on the roads surrounding our schools. Wyndham Mayor Bob Fairclough said the campaign had many benefits. “Not only will our schoolchildren gain an advantage from walking to school rather than sitting in the car, but their parents and the wider community will also benefit,” Cr Fairclough said. “In addition to improving their physical health by getting some exercise, it also gives parents more time to talk to their children and strengthen their relationship. “Walking to school will also decrease the amount of congestion on our roads at school times, which is one of the objectives of our Get Wyndham Moving congestion campaign.